The Association of Chess Professionals (ACP) is a not-for-profit organisation, whose main purpose is the protection of chess professionals’ rights and the practice and promotion of chess worldwide, in particular through the organisation of chess tournaments and other chess events. The ACP encourages the civil engagement of chess professionals, interacts with national federations, international corporations, government agencies as well as other not-for-profit organizations. 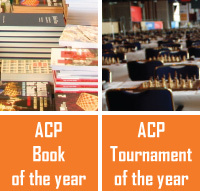 ACP members are experts in all aspects of chess related activities. The world’s top players and renowned journalists, tournament organizers and the most respected arbiters and trainers have joined the ACP in order to make the professional chess world a better place. Download the ACP Brochure 2015 here.